He’s still got the killer abs but the DC Designer Series Batman by Mike Mignola Colored Statue gives us a different look at the Dark Knight; a look that’s missing his broad shoulders. Standing about 13 1/6-inches tall, this unique vision of Batman is brought to us by Mike Mignola, creator of Dark Horse Comics’ “Mignola-verse,” which includes Hellboy, Joe Golem, and B.P.R.D. And if you’ve seen his work on Hellboy, you’ll understand the sloped shoulder look now. Sculpted by Jonathan Matthews, the 1:6 scale polyresin statue is limited to just 5000 pieces. Coming June 2018. Preorder now for $119.99 at Entertainment Earth. And speaking of Hellboy, take a peek at the First Hellboy Statue to see what the cigar-chomping demon originally looked like. 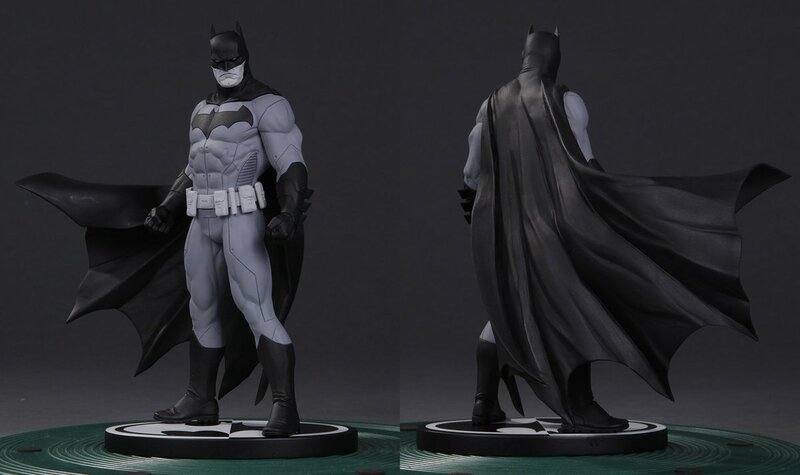 Yeah, that's a larger version of the one from the Batman Black & White statue line. I own the B&W version, so I won't be picking this one up. Also, I think the black and grey look would have been way better. I wonder if this is where they are headed: take the B&W line, making it bigger and colorizing it. If they do a 1/6 version of the Fabok Bats, then I will be all over it! I would consider buying two. All times are GMT -3. The time now is 09:33:31 PM.